Flat Earth map drawn by Orlando Ferguson in 1893. 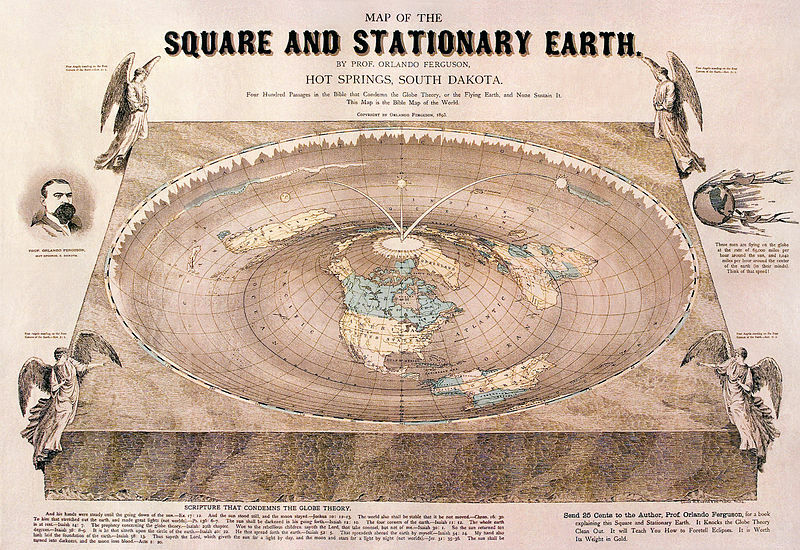 A "flat-Earth" map drawn by Orlando Ferguson in 1893. Actual map in support of the Flat Earth. Four Angels standing on the Four Corners of the Earth—Rev. 7: 1. These men are flying on the globe at a rate of 65,000 miles per hour around the sun, and 1,042 miles per hour around the center of the earth (in their minds). Think of that speed! And his hands were steady until the going down of the sun—Ex. 17: 12. And the sun stood still, and the moon stayed.—Joshua 10: 12–13. The world also shall be stable that it not be moved.—Chron. 16: 30. To him that stretched out the earth, and made great lights (not worlds).—Ps. 136: 6–7. The sun shall be darkened in his going forth.—Isaiah 12: 10. The four corners of the Earth.—Isaiah 11: 12. The whole earth is at rest.—Isaiah 14: 7. The prophecy concerning the globe theory.—Isaiah: 29th chapter. Woe to the rebellious children, sayeth the Lord, that take counsel, but not of me.—Isaiah 30: 1. So the sun returned ten degrees.—Isaiah 38: 8–9. It is he that sitteth upon the circle of the earth.—Isaiah 40: 22. He that spreads forth the earth.—Isaiah 52: 5. That spreadeth abroad the earth by myself.—Isaiah 54: 24. My hand also hath laid the foundation of the earth.—Isaiah 58: 13. Thus sayeth the Lord, which giveth the sun for a light by day, and the moon and stars for a light by night (not worlds).—Jer. 31: 35–36. The sun shall be turned into darkness, and the moon into blood.—Acts 2: 20. Send 25 cents to the Author, Prof. Orlando Ferguson, for a book explaining this Square and Stationary Earth. It Knocks the Globe Theory Clean Out. It will Teach You How to Foretell Eclipses. It is Worth Its Weight in Gold.